The ‘Gathering’ has to be one of the most amazing phenomenons that take place on Planet Earth. 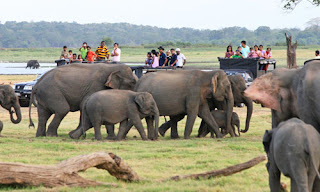 Every year around the month of July, hundreds of Sri Lankan Elephants (Elephas maximus maximus) converge at the Minneriya National Park in Sri Lanka and enjoy the lush grassland around the Minneriya Tank bed. 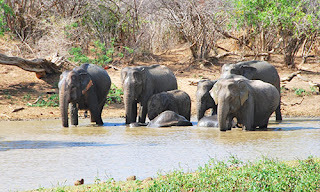 Once the long drought season begins in the Dry Zones of Hundreds of pachyderms travel for days, usually led by the matriarch of each heard, as she gathers them from their drought-ridden areas and brings them to this fertile and flat area where they can graze for weeks in quiet abandon. A full grown elephant needs an average of 100 liters of water a day. There will also be elephant calves, pregnant cows (female elephants) and a couple of bull elephants (males), identified by their long tusks, in the heard. Ironically, it is only once the water level recedes, due to the dry spell, that the grass starts to appear around the Minneriya Tank bed, which was built by King Mahasen around the 3rd Century AD. King Mahasen (276-303), ruled the Kingdom of Anuradhapura and was known as a great visionary and tank builder. The Minneriya tank originally occupied 4670 acres and featured a 13 meter tall dam that spanned a distance of 2km and held over 20 billion gallons of water which was channeled from the Mahaweli River. The dam and reservoir fell into a dilapidated state but was restored by the British in the mid 1800’s. 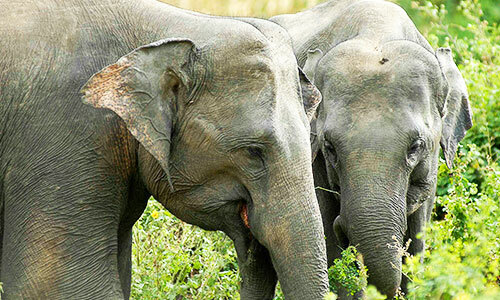 The Minneriya National Park is part of the ‘elephant corridor’ and meshes with the Wasgamuwa National Park and the Kaudulla National Park. However, Minneriya is the largest known gathering place of elephants in the world. The Elephants do well and stay away from the mugger crocodiles that also come to the tank to bake in the sun and lazily swim about. While on safari, you will also see a host of other wildlife such as monkeys, wild buffalo, Grey Langers, spotted and sambar deer and so many more. If you are fortunate, you may also spot a Sri Lankan Leopard (Panthera pardus kotiya) prowling around. The tank bed also invites many birds, such as egrets, painted storks and the dark bellied fish eagle that come to fish and preen in the shallow waters. There are over 170 species of birds that fly in to the park to wade, socialize and do a spot of fishing. The Woodsand Piper, Common Sandpiper & Kentish Plovers are waders who like to pop in, and there are forest birds like the Malabar-pied Hornbills, Rufus Woodpecker the globally endangered Lesser Adjutant. You will also easily spot the endemic Sri Lanka Grey Horn-bill, Sri Lanka Green Pigeon, Brown-capped Babbler and Sri Lanka Jungle Fowl in and around the park. There are is no accommodation provided for humans within the 8.889 hectares that covers the park and its boundaries, so you would need to travel to Polonnaruwa, Sigiriya, Habarana or Giritale which are a relatively short drive away to stay in a luxury hotel or a more rustic lodge. Optimum times to witness the gathering is between July and September so if you are planning on a holiday to Sri Lanka, make sure you request a safari to the park, this elephant convention is one you will not want to miss!